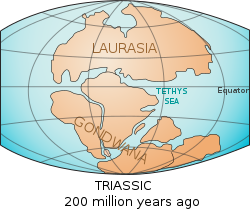 The Tethys Ocean existed between the continents of Gondwana and Laurasia during much of the Mesozoic era. Several smaller versions have existed down to the present day. Today's Black Sea, Caspian Sea, and Aral Sea are remnants of the Tethys. Tethys Ocean proper, or Neo-Tethys, existed between the continents of Gondwana and Laurasia before the opening of the Indian and Atlantic oceans during the Cretaceous period. Roughly, a bigger Mediterranean, continuing right through to the Indian Ocean. Alpine or Paratethys sea to the north of the Tethys, roughly where the Alps are today. This page was last changed on 9 March 2014, at 19:47.